When Wario finished building his castle, he loaded all of his treasure into the basement, unaware that a black jewel he had stolen contained an ancient evil. 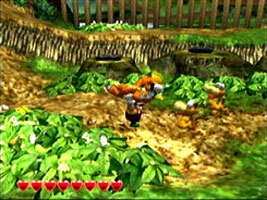 Wario's treasure is turned into monsters, and the castle is broken into rubble. 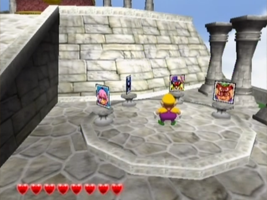 If Wario wants his treasure and his castle back, he has to fight his way through several worlds and destroy the black jewel. Wario has to bash enemies and use them as weapons or weights for switches. If Wario takes damage he can replenish his hearts with Garlic. Each world has eight treasure chests, eight secret areas containing red crystals and gold statue parts and five spritelings. Find	them all and take on the bosses to open the way to the black jewel. 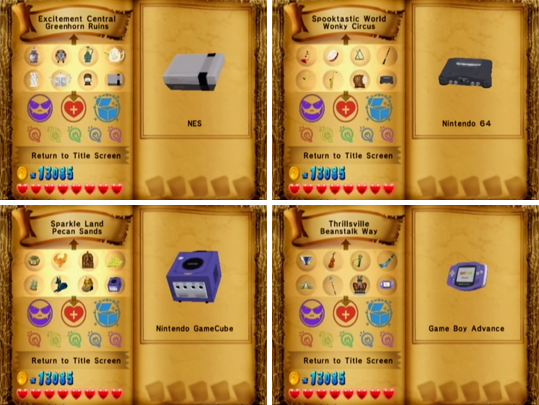 When you find all 8 treasure chests in a stage, a card featuring one of the characters from WarioWare Inc.: Mega Microgames will appear in front of the giant treasure chest in the hubworld. The cards that appear are: Wario, Jimmy T, 9-Volt, Mona, Kat, Orbulon, Dr. Crygor and Dribble. If you hit one of the cards, the game will download a set of demo microgames to a Game Boy Advance connected using the GCN-GBA Link Cable.